I liked the cabin and location. It was very nice. I think your company should.consider having more than one garbage bag and also provide coffee filters for your coffee maker that you provide. Overall we had a good time in TN. We always book thru CABINS USA & everything has been great. Staff & accommodations are top notch in all aspects. Recommend using their website for your stay in the mountains. You will not be disappointed. We have stayed in this cabin twice now and we have enjoyed it both times. Will definitely be booking again for the spring! 2nd time staying in this cabin and it was as great the 2nd time as it was the 1st time!! No cell service need WiFi. Loved this cabin my husband and I stayed 6 nights. The only complaint we have is that there were dirty plates in the cabinet so we washed ALL of the dishes to make sure they were clean. Cabin was great. Very quiet at night. We had a great time and staff was very friendly. Looking forward to renting again. Everything was great. I just thought we would have a better view of the mountains. No fault of anyone. Great place to stay,and get away from it all. love it!!!! This was our 2nd stay at Moose Tracks - both stays were amazing. We have booked with CABINS USA on multiple trips & every cabin was true to its pics. All of the staff was great to work with & maintenance was very quick to answer our calls for fast fixes on anything we needed. The ONLY thing I wish they had was WIFI & better cell phone reception. ALL IN ALL - I highly recommended CABINS USA. This was our first time to Pigeon Forge. A Co-Worker recommend we book through Cabins USA. I searched and booked this cabin online. I was sent an email to register for express check in. My door code and directions were emailed to me the day before as promised. The cabin was awesome! We loved the location. It was very clean and comfortable. We would definitely book with Cabins USA again and recommend "Moose Tracks"! My wife and I had a wonderful getaway at this cabin although there are a few things that need to be brought to your attention. The master bathroom shower would not drain while the shower was running. Also the living room remote needs to be replaced as some of the buttons do not work. We would definitely love to come back to this cabin and stay sometime! Beautiful cabin inside and out great location. We had a wonderful experience all the way around. Looking forward to returning for another visit. Really enjoyed the stay and how easy it was to book, check in and out! Something that I would recommend is WiFi but other then that everything was great! Loved our cabin. It was so clean and cozy. Location is great! So close to the entrance of the Smoky mountains so you avoid all the parkway traffic. The cabin has a great view without the steep drive up. The drive to the main st. Parkway is a pretty drive. Very quiet. Will def. rent again for our yearly Christmas/ New Year vacation in the Smoky’s. Also staff is very friendly and attentive. Very nice, would definitely come back. It was my girlfriend and my first Christmas together we could not have ask for a better or more beautiful place to be for our first. The only things we are going to complain about is the bed was a little to hard, and no WiFi, hardly any phone service and the land lines did not work. Other than that it was the absolute best weekend, thank you so much. Eric and sheila. This was a birthday get away surprise for me from my significant other. The cabin was beautiful. Christmas de orations was a nice unexpected bonus. Most of the acccimdqtions were satisfactory. However, one of the main reasons he chose this cabin was for the hot tub on the porch overlooking the mountains. When we returned from dinner out, we anticipated a relaxing time in the hot tub. I had recently been suffering from a sciatica nerve inpinchment and badly needed relief. Unfortunately this was not what we received. There was a sign on the wall regarding the rules for the hot tub but no where was a sign on how to turn on the hot tub or where the switch was located.. In the dark we looked everywhere for a switch, under, around, nothing. The buttons the hot tub were mashed down and could barely be read. I called the office to have someone help us quickly. She told us that she would send someone out immediately. We waited till 11:30 pm and no one returned our call to check up on us nor did anyone come help. We were sorely disappointed that this part of our stay was sacrificed. Im hoping the company will be professional and honor a complimentary stay or discount for our return stay. Thank you for taking the time to letting us know about your recent stay in Moose Tracks! We here at Cabins USA work hard to make sure each of our guests have the best stay possible while vacationing in the Smokies. I apologize you were unable to utilize the hot tub during your stay, I have forwarded your concern to the appropriate department. When you are ready to stay with us again, please mention you are a return guest for an additional discount. Thank you again for your review and thank you for choosing Cabins USA! Aside from a few cobwebs and dead remote batteries, cabin was nice. The drive way gravel is loose and hard to drive out of going uphill without spinning (no doubt from other people who do not know how to drive on lose gravel in the mountains and have burmed it up). Cabin worth recommending!! The cabin was great but there should be more dishes and silverware. There were only 2 teaspoons there and the trash can should be bigger. It was more like a bathroom can. The staff was great and the cabin was beautiful. This cabin was probably one of the cleanest places we have ever stayed. My husband and I went for our 25th wedding anniversary. It was very relaxing and secluded and the rooms were spacious. We did our complete booking, check-in and check-out online and by email and everything went perfectly! Thank you Cabins USA! The cabin was beautiful. Very clean. Secluded area. We did the early online check in so we went straight to the cabin. There were a couple of hair pin turns. Don't think we would have found it without GPS. Was a little surprised to find there was no foil, plastic wrap etc.there. So you might want to bring your own. All in all the place was beautiful and we really enjoyed it. Would definitely go back and have already recommended it to friends and family! This cabin was in a very convenient location to the parkway, very clean and comfortable. When we first arrived we realized the hot tub was not working. I called the office and maintenance came out and fixed the problem that very day while we were out enjoying our trip. Would absolutely recommend this cabin to everyone! We really enjoyed our stay at Moose Tracks. This cabin is perfectly located and offers some great privacy. We are actually planning to reserve it for next year soon to make sure we get this one again. My only complaint would be that there is lots of mold under the sink and the counter and floor didn't appear to be cleaned prior to our arrival. I would definitely consider using a different cleaning crew if this cabin was cleaned before our arrival as we had to do some cleaning when we arrived which I feel was not our job. You can leave this portion out if you want to post our review as I am confident this was an isolated incident as we have stayed with Cabins USA many times and have never had issue with cleanliness of any cabin until this trip. We will actually be booking very soon for New Years. We had a wonderful time! The only problem with check in was the fact that we had to wait until 4pm to enter the cabin. It was kind of pricey but all in all I feel like it was worth it for an annual vacation. The location is fine just not much of a view. There are other cabins on the road but with the way they're situated it's still fairly private. I am so happy to hear that everyone enjoyed their stay in Moose Tracks! We here at Cabins USA strive to give each of our guests the best stay possible while vacationing in the Smokies. Thank you for choosing Cabins USA and we look forward to having you as our guest again soon! The cabin was beautiful, but location was definitely off the beaten path. It is very difficult to find, even with the instructions. The road to get there was very narrow and steep. The driveway is on an incline and was gravel, which made it very difficult to back in and out. We had to end up parking sideways, which seemed to help. The cabin was clean, but I saw two roaches (one in the kitchen and one in the master bath). I called the office, but was directed to a voicemail service. No one ever called me back. If you have AT&T beware, you will not have a signal. Luckily one of us had Sprint and we were able to make calls as needed, since the cabin phone did not work! The cabin isn't far from the main drag, but as stated earlier, it is in a terrible location and we made sure to get back before dark. Wonderful !!!!!!!!!!!!!! We stayed 3 nights and we cant wait to come back again. The only thing that maybe could be done is to add a Hairdryer, and a sponge for the dishes! Otherwise a great place to stay. We will be booking again. Thank you for all of your kind words! We here at Cabins USA strive to give each of our guests the best stay possible while vacationing in the Smokies. Thank you again for your review and thank you for choosing Cabins USA! Cabin was perfect for my family of three. Cabin is located in a private area but easy to find and close to town. Cabin was exactly as shown and very clean . The only reason for not giving all 10's would be there is no Wi-fi and with our cell phone carrier (AT&T) we had no cell reception for either calls or internet. If you are looking for a place to "unplug" this cabin will suit you well. There is however a land line phone for emergencies. Even with no internet I would not hesitate to book this cabin or with CabinsUSA again. I am so happy to hear that everyone enjoyed their stay in Moose Tracks! We here at Cabins USA strive to give each guest the same great stay you enjoyed while vacationing in the Smokies. When you are ready to stay with us again, please mention you are a return guest for an additional discount. Thank you again for choosing Cabins USA and we look forward to seeing you again soon! We arrived 45min prior to occupancy and checked-in in less than 10 minutes. Cabin was eaay to find and just as expected. Only negative we experienced was the tv service was off and couldn't be fixed during our stay. Not a big deal to my girl and me, but if we brought the kids, would've been an issue. Also th downstairs tub wouldn't drain, but we used the other bath instead and had no problems. Altogether a wonderful, relaxing, private stay. Close to town but secluded. And the grill is gas, not charcoal. Thank you for taking the time to let us know about your recent stay in Moose Tracks! We here at Cabins USA strive to give each of our guests the best stay possible while vacationing in the Smokies. I apologize for the issues you experienced with the televisions. When you are ready to stay with us again, please mention you are a return guest for an additional discount. Thank you for choosing Cabins USA and we look forward to having you as our guest again soon! The cabin was beautiful, clean and very comfortable. It was exactly as the pictures showed it to be. However, we were disappointed that we had only 2 channels on 2 TV's and the bedroom TV did not work at all. We left a message regarding the problem the night we arrived, Sunday, went to the office on Tuesday to ask for this to be fixed and for a garbage pick up. We were told maintenance would come and check on the TV issue and the garbage would be picked up after 4:00. The garbage was not picked up until the following afternoon and no one from maintenance ever came to check on the TV service. These were minor issues in the overall picture. We thoroughly enjoyed our stay and will definitely be back next year. This is a wonderful cabin. Very clean and private enough. There was only one issue, no satellite/cable tv,but the staff were notified and it was taken care of. I've stayed in Pigeon Forge/Gatlinburg many times ,this was my first seeing bears. The momma bear and her two cubs were under and around the deck area on Sunday. What an experience!!! Returning in September! I am so happy to hear that you enjoyed your stay in Moose Tracks! We here at Cabins USA strive to give each of our guests the best stay possible while vacationing in the Smokies. When you are ready to stay with us again, please mention you are a return guest for an additional discount. Thank you for choosing Cabins USA and we look forward to having you as our guest again soon! The only disappointment I had was that you advertise that everything is in the cabin that you need but it wasn't. There was no dish soap (except for the dishwasher), no hand soap in the kitchen and no wash cloth and towel for the kitchen. Additionally, the batteries in the remote for the loft were missing so we had to carry the batteries upstairs and back downstairs to keep swapping in the remotes. On the positive side, the cabin was beautiful, spotless and very comfortable! Check in was a breeze and we found the cabin without too much difficulty. Might be helpful to put the names of the cabins on them just for peace of mind. We will definitely come back and stay in one of your cabins again! Loved the cabin, location, cleanliness, and staff. Could use internet, and a better mattress. Will definitely use this company again! Thank you for all of your kind words! We here at Cabins USA work hard to make sure each of our guests have the best stay possible while vacationing in the Smokies. When you are ready to stay with us again, please mention you are a return guest for an extra discount. Thank you again for your review and thank you for choosing Cabins USA! My family and I had a wonderful time. It was one of the cleanest cabins we have ever stayed in. It was secluded, but close to town. We will definitely come again. I am so happy to hear that you enjoyed your stay in Moose Tracks! We here at Cabins USA work hard to make sure each of our guests have the same great stay you enjoyed while vacationing in the Smokies. When you are ready to stay with us again, please mention you are a return guest for an additional discount. Thank you again for your review and thank you for choosing Cabins USA! We really enjoyed ourselves, and will definitely be back again! I am so happy to hear that you enjoyed your stay in Moose Tracks! When you are ready to stay with us again, please mention you are a return guest for an additional discount. Thank you again for your review and thank you for choosing Cabins USA! Had a wonderful time at Moose tracks. It is not usually warm in February but for a few days it was unseasonably warm and the air conditioner did not accommodate the cabin. It did get cool soon thereafter and this was no longer an issue. Loved the hot tub but missed the indoor jetted tube we had last year. There was not a picture of the tub/bathroom on the website. We enjoyed our stay and would recommend Cabins USA to friends. Thanks. Thank you for taking the time to let us know about your recent stay in Moose Tracks! We here at Cabins USA work hard to make sure each of our guests have the same great experience you enjoyed while vacationing in the Smokies. Thank you for letting us know about the air conditioning. Your comments have been forwarded to our maintenance department to be addressed. When you are ready to stay with us again, please mention you are a return guest for an additional discount. Thank you again for your review and thank you for choosing Cabins USA! Beautiful cabin in a great location. Check in was busy but we were checked in quickly and promptly. Staff was was very friendly and helpful. Will stay with Cabins USA again. Thank you for taking the time to let us know! We here at Cabins USA work hard to make sure each of our guests have the same great stay you enjoyed while vacationing in the Smokies. When you are ready to stay with us again, please mention you are a return guest for an additional discount. Thank you again for your review and thank you for choosing Cabins USA! 90 yr old m-n-l , daughter & boyfriend stayed at Moose Tracks. Concerned there was no phone service available if needing to reach her. Had dial tone for first try & then none. Called office & told that Moose Tracks had no listed number & our other 2 cabins we stayed in, had same numbers! Moose Tracks had water leak coming from upstairs shower into kitchen. Very few amenities this time around in kitchen. Booking through Cabins USA is the most stress free process. Everything was easy and super clean. I can't wait to stay there again! Loved the cabin! It was gorgeous. Just like in the pictures. I would definitely come back. Great Cabin, quiet and location is convenient. WIFI service would have made this an excellent stay. Thank you for all of your kind words! We here at Cabins USA work hard to make sure each of our guests have the same great stay you enjoyed while vacationing in the Smokies. Thank you for your suggestion of WiFi at the cabin. Your comments have been forwarded to our Owner Liaisons and they will be bringing this to the owner's attention. When you are ready to stay with us again, please mention you are a return guest for an additional discount. Thank you again for your review and thank you for choosing Cabins USA! I was very pleased with the cabin. It was very nice and clean. The only complaint i have with the cabin is i couldn't get the full veiw on the back porch , but other than that i loved it. I am so happy to hear you enjoyed your stay in Moose Tracks! Our cleaners work hard to make sure our cabins are thoroughly cleaned and fully stocked so all our guests have to do is walk into their cabin and start relaxing. Thank you for letting us know about the view of the back porch. Your comments have been forwarded to our Owner Liaisons and they will be bringing this to the owner's attention. When you are ready to stay with us again, please mention you are a return guest for an additional discount. Thank you again for your review and htank you for choosing Cabins USA! The property and process was great! However the website is sort of a lie. The view is not what you see online. They must have taken the picture 10 years ago because the trees have grown up past the deck and blocks your view completely. The only other thing is the hot tub, it smelled weird. Even with leaving the top off all day to try and air it out we could not get the smell to go away. Other then that the property was great! The phone in the cabin did not have a dial tone, would have liked to have an adjustable shower head, and there was no DVD player. These are simple things to fix/change that would have made a huge difference. Not having a working phone in the mountains where there is limited cell coverage is something that is really not acceptable, as emergencies happen and someone may need to receive a call or make an emergency call. Everything else was in working order, bed was comfortable, and we had a pleasant stay. The cabin was perfect for a romantic get away for my fiancé's birthday!!! The location is minutes away from everything. It was really clean and we enjoyed the seclusion of the cabin. We did however have a bear to come visit use not once but twice. I was within 15 feet of a medium sized black bear while cooking on the grill, but he was not aggressive and went on his way after I ran back in the cabin. The second time, he just came to see what leftovers we had in the trash. I would recommend this cabin 100%. We plan to return soon. The only negative I had, was the driveway was gravel and uneven. I was difficult to get in and out of the driveway. Thank you for taking the time to let us know about your recent stay in Moose Tracks! We here at Cabins USA work hard to make sure each of our guests have the same great stay you enjoyed while vacationing in the Smokies. When you are ready to stay with us again, please mention you are a return guest for an additional discount. Thank you for choosing Cabins USA and we look forward to having you as our guest again! Cabins USA made the entire booking process so easy. The staff were very helpful. The cabin was spotless and absolutely everything we expected and more. The pictures did not do Moose Tracks justice. It was an amazing stay and we will definitely be back! Thank you for all of your kind words! We here at Cabins USA work hard to make sure each of our guests have the same great stay you enjoyed while vacationing in the Smokies. When you re ready to stay with us again, please mention you are a return guest for an additional discount. Thank you again for your review and we look forward to having you as our guest again! Perfect can't wait to come back!!!! Thank you for your suggestion. It has been forwarded to our Owner Liaison and she will be speaking with the owner of the cabin. When you are ready to stay with us again, please mention you are a return guest for an additional discount. Thank you for choosing Cabins USA and we look forward to having you as our guest again! The cabin was great, very clean and very spacious and private. The location is great as well. Close to all the major shopping areas. There does however need to be a sign with the cabin name at the end of the driveway. Had a great time and look forward to the next trip. I am so happy to hear that you enjoyed your stay in Moose Tracks! We here at Cabins USA work hard to make sure that each of our guests have the same great stay you enjoyed while vacationing in the Smokies. When you are ready to stay with us again, please mention you are a return guest for an additional discount. Thank you for choosing Cabins USA and we look forward to having you as our guest again! Love this cabin and the location I will be booking it again soon!! I am so happy to hear that you enjoyed your stay in Moose Tracks! When you are ready to stay with us again, please mention you are a return guest for an additional discount. Thank you for choosing Cabins USA and we look forward to having you as our guest again! This is our second stay with Cabins USA and we had a great time! The only thing we suggest is actually having a gas grill outside like another cabin we've stayed at instead of the little ones you see at a park and some trees cut back so the view is a little better! Other than that it felt like home to us! Will definitely use them again next trip! Thank you for all of your kind words! We here at Cabins USA work hard to make sure that each of our guests have the same great stay you enjoyed while vacationing in the Smokies. Thank you for your suggestion about the grill. That has been forwarded to our Owner Liaisons and they will be speaking with the owner of the cabin regarding this. Thank you again for your review and thank you for continuing to choose Cabins USA! Everything was good except the bed. It was really a hard bed. Second I would have made sure the lock was working. Had to wait an hour and a half after we arrived before we could enter the cabin. This was our first time renting a cabin and I can say that after this experience with Cabins USA we will definitely be back! The process for booking, checking in And checking out was excellent and so easy. The Cabin was exactly as pictured and very clean! Thank you so much for all of your kind words! We here at Cabins USA work hard to make sure that each of our guests have the same great stay you enjoyed while vacationing in the Smokies. When you are ready to stay with us again, please mention you are a return guest for an additional discount. Thank you again for your review and we look forward to seeing you again soon! Very nice cabin, beautifully decorated, clean with nice furnishings !!!! I think all cabins are overpriced, but the wife wanted to stay in a cabin rather than a room in hotel. The added fees are something that I understand cannot be avoided, but really cause price to be almost too high to afford!! This was our first time bringing our 16 month old to the mountains and besides the scary drive up to the cabin or was perfect for our family of 3! The dishwasher wasn't bolted in or something but still worked. Overall we enjoyed our stay and hope to be back next month! I am so happy to hear that everyone enjoyed their stay in Moose Tracks! We here at Cabins USA work hard to make sure that each of our guests have the same great stay you experienced while vacationing in the Smokies. Thank you for letting us know about the dishwasher. Maintenance will be looking into that issue so it can be corrected as quickly as possible. When you're ready to stay with us again, please mention you are a return guest for an additional discount. Thank you again for your review and thank you for choosing Cabins USA! Beautiful cabin in a beautiful location! I am so happy to hear that you enjoyed your stay in Moose Tracks! When you are ready to stay with us again, please let our reservationists know you are a return guest for an additional discount. Thank you for choosing Cabins USA and we look forward to seeing you again soon! Perfect cabin. This cabin is identical to Knotty and Nice with the exception that Moose Tracks has Direct-TV as Knotty and Nice has Dish. This cabin is in the same location, just further up the hill. This is our second trip in 3 weeks using Cabins USA. I would visit every other weekend if I could and use Cabins USA every time. The only hold up on this cabin was it was closer to the road than Knotty and Nice but still very quiet and private. We cook in several meals and there was enough pots and pans but as for a blender or mixer, out of luck unless you bring one from home. I would recommend this cabin to any couple or small family. Love, love, love these two cabins and I will reserve this particular cabin again in the near future. I just cannot say enough pleasant things about these two cabins. Cabins USA makes check in and check out very pain free and the staff is very pleasant and helpful. I would recommend Cabins USA for anyone's visit to the area. Thank you so much for all of your kind words! We always appreciate it when our guests choose to stay with us time after time. 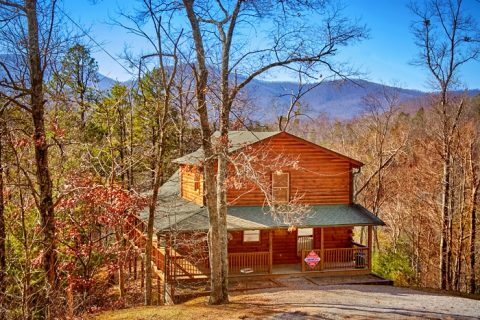 No matter what you're looking for in a cabin, Cabins USA is sure to have the perfect cabin for your next trip to the Smokies. Thank you again for your review and thank you for always choosing Cabins USA! Moose tracks was GREAT! Celebrated our 10 year anniversary and have a wonderful time. It was clean and spacious. The only thing that would be nice is if there was a ceiling fan in the bedroom. Other than that it was perfect! The cabin was beautiful, comfortable & very clean. However the location in the middle of an unexpected snow/ice storm was very bad. The entire family had to get a hotel room one night since we couldn't get up to our cabin (where all of our belongings were). Which was another $70. We slid into a ditch & had to pay a tow truck $550 to pull us out trying to get up to the cabin the next day. Then we (the kids included) ended up walking up to our cabin .6 of a mile in the snow & ice just so we could spend one night in it since we paid for it and couldn't get a refund, credit or nothing. When I called and explained the situation all they offered was for a truck to come out and put some salt down.....and this is after we ditched the car. So needless to say we had to carry all of our luggage, groceries & other items back down the icy road to the car at the bottom of the hill. Then they expect you to call to check out and of course I was on hold for 9 minutes before hanging up. Totally ridiculous!!!! This cabin completely exceeded our expectations! We were blow away by how clean and new the cabin felt. We would definitely recommend staying here and would love to come back in the future. Booking the cabin was super easy and the company had so many cabins/ locations to choose from. Checking in was quick and painless. Checking out was even easier! We felt completely safe during our stay and felt right at home. We had a wonderful experience! We loved this cabin, very private, beautiful view from deck & upstairs! The only thing that I did not like is this cabin does not have internet access or a phone & cell phone reception in very limited depending on where you stand. The cabin was Beautiful, the bed was very comfortable, the hot tub was Great! The snow was wonderful & again the View is breathtaking! We will definitely go with Cabins USA for our next trip, this was exactly what me & my husband needed. It is very private & we Loved that! Not far at all from the Parkway so didn't take us long to get anywhere! I loved the girl that helped me find this property & booked this for us! I love the discounts they give for signing up for the emails! Everything was Truly Great! Would highly recommend to anyone wanting a getaway! Thanks so much for everything! Thank you for your review. We apologize if you were inconvenienced in any way. All of our cabins are privately owned and will vary in the amenities, furnishings, and electronics in the cabins. Please always feel free to call our office and allow us to assist you with finding the perfect cabin that will fit all your needs. We hope that we will hear from you again in the future. Do not forget about our return guest discount.